Mumbai lost all their last three games against RR. Quinton de Kock came well after a long time for the Mumbai Indians (MI). In the game against the Rajasthan Royals (RR), he took the attack to the opposition along with skipper Rohit Sharma who scored 47 runs. The wicket-keeper went on to score 81 runs which came off just 52 balls. It was heartening to see him bat that way in this game and his innings included 6 fours and 4 sixes. Even though they slowed down during the middle overs, Hardik Pandya finished well for the home team. He raced his way to 28 runs from just 11 balls to take his team to a respectable total. However, Mumbai finished with a score they wouldn’t have been content with. It seemed as if they’d get over 220 after the kind of start they got. But, they could only get 187 runs in their quota of 20 overs. In the chase, Ajinkya Rahane was the aggressor initially. He smashed 37 runs up front and it was all class from India’s Test vice-captain. After he fell, Jos Buttler took over and virtually finished the job for his team. He smashed Alzarri Joseph for 28 runs in one of the overs and put his brutal hitting on display. 70 out of the 89 runs he scored came in boundaries itself. After getting to 89 from 43 balls, he miscued one off the bowling of Rahul Chahar and got out. The Royals lost some quick wickets towards the end and were under pressure. Even though the Mumbai Indians pushed hard for a win, they didn’t have much to defend after the Buttler onslaught. Shryeas Gopal was the man who finished the game for his team with 4 balls to spare by scoring an unbeaten 7-ball 13. Ajinkya Rahane was great with his captaincy in the match. He rotated his bowlers well after the Mumbai Indians got off to a flyer and kept things under control. Moreover, he played one of his best knocks this season with the bat in this match. He was the aggressor in the partnership with Jos Buttler and scored 37 off 21 balls. Jos Buttler will get a perfect 10 for this game. It is a rarity that a player gets full marks but Buttler hasn’t put a foot wrong in the match. He was exceptional on the field and plucked three terrific catches. With the bat, he was on fire and almost won it for the Royals all by himself. He scored 89 runs and did half the job by the time he got out. Sanju Samson played a decent knock in this match. By the time he walked in, the asking rate was under control and thus he didn’t need to take the risks. He hit two good fours and one six in his innings. However, he failed to finish the game and got out after he scored 31 runs. Steve Smith walked in at number four at a crucial juncture. However, he played a very poor knock. He took 15 balls to score 12 runs and got out when his team was inches away from a win. Even though he should have finished it, Smith got out leaving his team in troubled territories. Rahul Tripathi played a terrible shot even when the team wasn’t in pressure. This created a lot of pressure on the other batsmen towards the end. He only managed to score 1 run off 2 balls. Liam Livingstone also put his hands up in the pressure situation playing in his maiden IPL match. He also scored just 1 run off 2 balls and will get a similar rating as Rahul Tripathi. Shreyas Gopal was one of the best bowlers for RR in this match. Even though he couldn’t pick up any wickets, he restricted the batsmen and gave away 21 runs in 4 overs. Moreover, he also finished the game for his side with a 7-ball 13. Krishnappa Gowtham conceded 39 runs in the three overs that he bowled at an economy rate of 13. He had nothing to do with the bat either. The all-rounder faced one ball towards the end and didn’t score any runs of it. 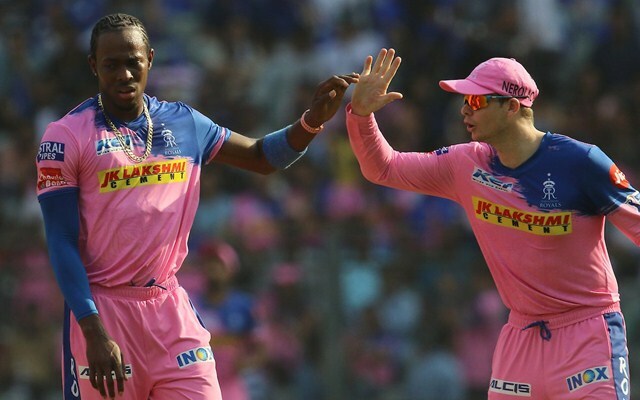 Jofra Archer picked up the crucial wickets of Rohit Sharma, Quinton de Kock and Kieron Pollard in this match. Even though he went for a few runs, these wickets helped RR storm back into the game when they were under the pump. Thus, he gets 8 points for his performance. Jaydev Unadkat put up one of his better performances in this match. He bowled well in his first three overs and used his variations well. But Hardik Pandya smocked him for a few in the final over of the innings. The left-arm pacer accounted for the wicket of Ishan Kishan. Dhawal Kulkarni also brought out a performance similar to that of Jaydev Unadkat. However, he didn’t bowl at the death and thus his rating is slightly reduced. The pacer bowled all his four overs in this game and conceded 38 runs. He picked up the wicket of his Mumbai teammate Suryakumar Yadav.